In this post I continue my series on the omega current by discussing how a mutation that removes a charged group from the voltage-sensor domain (VSD) would be highly destabilizing and disruptive. The omega current is a leak current that passes through the VSD of mutated voltage-gated cation channels. In some cases, the mutated channels form a large pore through the VSD (the so-called omega pore) that passes ions as large as guanidinium. The central question surrounding the formation of an omega pore through the VSD is whether the mutations reveal a cryptic gating-charge pore through the VSD (I will call this the cryptic pore hypothesis), or whether the mutations simply disrupt the native structure of the VSD resulting in ionic leak (I will call this the disruption hypothesis). As I discussed in my previous posts, these two hypotheses for omega pore formation lead to very different conclusions concerning our understanding of the mechanism of voltage gating. Evidence from naturally-occurring omega-current-causing mutations suggested that in certain cases of mutation to tryptophan the disruption hypothesis is most likely. This leads to the questions: is it possible “that all of the other mutations also disrupt the structure? Even the mutations to smaller side chains? And if so why?” In this post I will argue that it is plausible that even the omega-current-causing mutations of the S4 arginines to smaller side chains significantly disrupt the structure of the VSD and that this limits the amount we can learn about the mechanism of voltage sensing from the cryptic pore hypothesis. The permittivity of the lipid bilayer is low. Before I discuss the omega-current-causing mutations, I need to introduce the concept of the electrical permittivity of a medium. This is a complex, well-characterized physical property that is important in electronics. It is also plays a very important role in membrane biophysics. I will not discuss the mathematics that underly the behavior of permittivity or the related electric susceptibility of a medium, but I will try to describe an intuitive way in which to think about it. It is commonly said that the membrane is a “low dielectric medium” or that the “dielectric constant of the membrane is small.” What this means is that the relative permittivity of the membrane is low, especially when compared to the aqueous cytoplasm and extracellular medium. The permittivity of a medium is the degree to which the medium permits the existence of an electric field. In other words, it is the degree to which media can stabilize the presence of charges. Every ion generates an electric field that influences the molecules around it. If these molecules are polar or polarizable, i.e. they contain or can easily generate an internal electrical dipole, they can rearrange themselves in such a way that stabilizes this electric field. Water, for example, is made up of polar H2O molecules that readily reorganize themselves around ions, stabilizing their charge. Essentially, water has high permittivity because the molecules can rearrange themselves in an electric field, lining up their dipoles to generate their own compensating electric field. The carbon chains of lipid fatty acids are not polar and are not significantly polarizable. Hence, the lipid membrane is really bad at stabilizing charges. The ability of a medium to stabilize charge has real energetic consequences when moving ions between different media. To move an ion from the high permittivity medium of water into the low permittivity medium of the membrane requires a substantial amount of energy – this is why ions do not spontaneously cross the membrane. Thermal noise, even at the high temperatures experienced by hyperthermophiles, does not provide enough energy to push an ion spontaneously through the membrane. This energetic barrier is why cells evolved ion channels in the first place. Ion channels are a type of enzyme that catalyze the conduction of ions across the low permittivity membrane by providing an environment that compensates for the charge of the ion. Although proteins themselves are polar molecules (the peptide bonds that link the amino acids along the protein main chain have a dipole moment), they are able to stably insert into the membrane because of the different properties of the amino acid side chains. Many amino acid side chains are hydrophobic, i.e. it is more energetically favorable for them to be buried (these are the non-polar, non-charged side chains). Conversely, other side chains are hydrophilic, i.e. it is more energetically favorable for them to be exposed to water (these are the polar or charged side chains). For soluble proteins, the hydrophilic residues are generally on the outside whereas the hydrophobic residues make up the core. In membrane proteins the opposite is true, the hydrophobic residues are on the outside interacting with the low permittivity membrane while the hydrophilic residues are turned inwards towards each other where they can mediate specific interactions. Exposing a polar or charged side chain in the middle of the membrane would greatly stress the protein structure. This is, of course, different on the surface of the membrane where the animo acid residues can interact with water or the charged phosphate head groups of the lipids. Because of the large energy cost of burying a charge in the low permittivity medium, membrane protein structures have evolved to minimize the number of charged amino acid side chains within their transmembrane segments. This tendency is so strong that it is easy to design algorithms to predict the presence of transmembrane segments simply from the relative hydrophobicity of the corresponding sequences. If – such as in the case of a voltage-sensor – the presence of a charged residue in the membrane is mechanistically required, then compensation for the charge must be provided by the protein structure. Usually, this compensation is provided by the presence of oppositely charged residues. This charge compensation can readily be seen in the structures of VSDs. Figure 1. Structure of the Kv1.2-2.1 paddle chimera VSD (PDB accession code 2R9R) showing the side chains of charged amino acid residues located within the membrane boundaries. The black lines delineate the approximate hydrophobic thickness of the bilayer. Charge compensation sites within the VSD are circled in pink. Side chain are colored by atom with carbon grey, oxygen red and nitrogen blue, except for the Phe233 side chain of the phenylalanine gap which is colored blue. As you can see in Fig.1, all of the positively charged S4 gating charges that are buried within the hydrophobic membrane are paired with a negatively charged residue from one of the other transmembrane helices (Glu183 on S1, Glu226 and Glu236 on S2 and Asp259 on S3a). This pairing stabilizes the charges in the membrane, hence, stabilizing the structure of the VSD itself. The internal charge-compensation site occupied by K5 in Fig.1 is known as the charge transfer center (Tao et al., 2010). 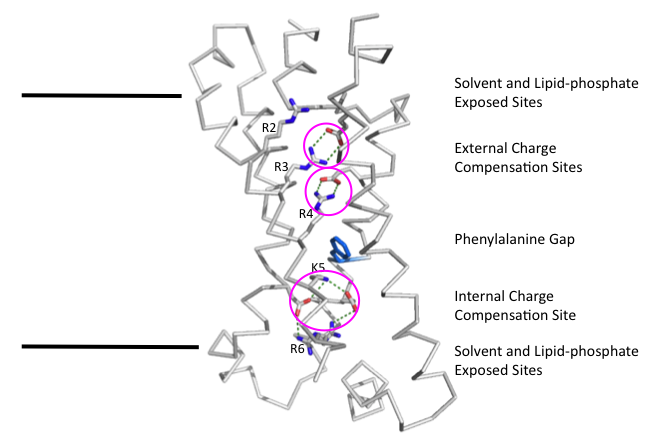 This site is different from the external charge-compensation sites by the presence of two negatively charged side chains and the proximity to the phenylalanine gap (represented by the blue side chain of Phe233 in Fig.1). The phenylalanine gap forms a hydrophobic barrier that separates the external and internal charge compensation clusters and is considered the most constrictive point within the VSD structure. The structure shown in Fig.1 is the depolarized conformation of the Kv1.2-2.1 paddle chimera VSD (Long et al., 2007). It is thought that, during gating, the S4 gating charge residues that occupy each of the charge compensation sites changes. For example, in the hyperpolarized state immediately preceding the depolarized state, R2 would be in the external charge compensation site occupied by R3 in Fig.1, R3 would be in the site occupied by R4 and R4 will be in the internal charge transfer center occupied by K5. This coordinated movement between the sites would allow for sustained charge compensation throughout the gating conformational changes of the VSD. In more hyperpolarized conformations, it is thought that R2 or even R1 (in the potential deeply hyperpolarized conformation, see my previous post) would occupy the charge transfer center. This would leave the external charge compensation sites unoccupied by positive charges and suggests that they would have to be solvent-exposed to prevent the large energy costs of unpaired charges in the low permittivity membrane. In a recent paper by Hoshi & Armstrong, it was shown that the extracellular charge compensation sites are likely unoccupied and solvent-exposed in a hyperpolarize conformation of the VSD (Hoshi & Armstrong, 2012). By adding the strong acid-binding tri-valent lanthanum ion (La3+) to the extracellular solution they were able to significantly slow down the opening of the Shaker Kv channel. Indeed, they even observed a slowing of gating charge movement in the presence of extracellular La3+, indicating an inhibitory effect of the ion on S4 movement (Hoshi & Armstrong, 2012). This led them to propose that the La3+ ions bind to the solvent exposed extracellular charge-compensation sites and compete with the S4 arginines for occupancy. This slows the movement of the S4 gating charge residues into these sites and hence, gating of the channels. I would speculate that, due to the reasonable hyperpolarization of -80 mV applied by Hoshi & Armstrong in this study, the majority of the VSDs would be in a hyperpolarized conformation corresponding to having R2 in the charge transfer center and not the deeply hyperpolarized conformation with R1 in the charged transfer center (see my previous post for more discussion on VSD hyperpolarized conformations). Tombola et al. showed that, upon stronger hyperpolarizations (>-100 mV), there is additional movement of S4 gating charge, which may correspond to the movement of R1 into the charge transfer center (Tombola et al., 2005). Moreover, recent work by Meng-chin et al. have shown that this deeply hyperpolarized conformation can be occupied at -80 mV in mutant VSDs in the presence of Zn2+ ions (Meng-chin et al., 2011). With R2 in the charge transfer center, only the outermost external charge compensation site would be unoccupied. Hence, the entire effect of the La3+ on gating may only be due to binding to the outermost acid (Glu183 on S1 in the Kv1.2-2.1 paddle chimera). The reason that it requires such strong hyperpolarizations to move R1 into the charge transfer site may be because of the energetic costs in removing the charge compensation from the lower external site. Of course, this is only speculation, and it has yet to be shown that the additional gating charge movement seen at strong hyperpolarizations corresponds to movement of R1 into the charge transfer center and not to some other conformational rearrangement within the VSD. Because of the low electrical permittivity of the membrane, removal of a single membrane-buried charged group would have large energetic cost that could significantly alter the conformational stability of different states of the VSD. Given that, as the structure clearly shows, the VSD has evolved to contain specifically matched charge-compensation sites, removal of one of the charges would leave the alternate charge in the site unpaired. In order to compensate for the large energetic cost of an unpaired charge, the structure of the VSD would likely distort. One of the most readily available mechanisms to compensate for this charge would be to adopt a conformation that allowed solvent accessibility into the VSD. As discussed above, polar water molecules are able to stabilize charges, and a distortion of the VSD structure that allowed water in would be energetically favorable. In certain conformations, this may even lead to a pore forming through the VSD bridging the extra- and intracellular solutions. Another possible mechanism to counter this missing charge would be for the VSD to adopt a conformation that allowed soluble, oppositely charged ions into the disrupted charge-compensation site. For example, in the case of a mutation of one of the S4 positive charges to a neutral amino acid, the binding of positively charged ions within the VSD would be favorable to compensate for the missing positive charge. This necessity for charge compensation would mean that, in the case of a pore being formed through the VSD, there would be selectivity for ions matching the charge of the missing side chain. If you remove a positive charge, you generate a cation selective pore due to the excess negative charge within the VSD. The opposite is true if you remove a negative charge from the VSD (see Musset et al., 2011). Because of the inherent instability of charges within the low permittivity membrane, the VSD has evolved a structure that contains specific charge-compensation sites to stabilize the gating charges within the membrane. Disruption of one of these charge-compensation sites by removal of one of the interacting charged residues would result in significant energetic penalties that would likely result in deformation of the VSD structure. Likely deformations of the structure would allow water or ions into the VSD in an attempt to stabilize the unpaired charge. Depending on the conformation of the VSD and on the identity of the mutated residue, this disruption of the structure could result in the formation of pores through the VSD. This argument supports the disruption hypothesis of the omega pore. If true, it would indicate that the leak current observed is not due to the exposure of a native cryptic-gating-charge pore, but instead due to a non-native distortion of the VSD structure. The VSD has evolved to balance competing forces. It requires charges in order to sense the membrane potential, but these charges are inherently unstable in the low permittivity membrane where they are needed. Evolution has found a structural solution to this problem in the four-helix bundle of the VSD. This solution is both elegant and delicate. Nature has used this four-helix bundle to regulate many different types of channels and enzymes. Additionally, through mechanisms we don’t yet fully understand, the voltage sensitivity of VSDs can be tweaked to respond to membrane potentials across the physiological range. However, if you try to understand this elegant mechanism by standard mutagenesis studies, you are more likely to disrupt the structure than to reveal its secrets. This frustration is well known to all who study these domains, and it forces us to be extra careful when interpreting data from mutated VSDs. The strong conservation of the negative charges and their positions as revealed in structure seem to strongly support the notion that charge-pairing is a potential mechanism whereby the putatively large energy barrier associated with translocation of the Args have been suppressed during the functional cycle of the voltage-sensors. However, E283 (external S2) which is potentially interacting with multiple positive charges on S2 is not conserved in several several VSDs such as those in the Nav, Cav and other Kv channel families. What forces stabilize the VSDs in such systems? A recent paper by Pless et. al. (Nature Chemical Biology, 2011) seems to suggest that the countercharges in the charge transfer center are also not involved in any electrostatic interaction, which stabilizes conformations. All the negative charges occur in a region bathed in water – the crystallographic waters in the 2R9R structure are strongly nestled around E283 (external S2) while the internal negative charges are in a deep broad crevice which in all likelihood is also water filled. Electrostatic interactions between the Args on S4 and the negative charges would be severely attenuated under such conditions. In fact in many soluble proteins it has been convincingly demonstrated that the desolvation penalty associated with a salt-bridge interaction is counter-intuitively, destabilizing. The paper by Hoshi and Armstrong have neglected to consider a crucial effect of La3+ – the 3+ charge! La3+ has strong surface charge effects (shields the phospholipid head groups and thus could potentially decelerate activation by interfering with the interactions of R1 with the lipid groups). (Mg2+ has been shown to exert such an effect by Diane Papazian’s group). Additionally, Islas and Sigworth (2001, JGP) had shown that increasing ionic strengths of the bulk medium could have large effects on the shape of electric field, simply by virtue of Debye-screening – La3+ (and its negative ions in the salt) would significantly enhance the ionic strength and thereby could also be potentially responsible for the effects described by Hoshi and Armstrong. Additionally, Hessaa-Von-Heijne have demonstrated that the S4 helix, despite the preponderance of positive charges can readily insert itself in the membrane. FTIR measurements of the S4 peptide also have shown the transmembrane orientation of the helix. Thus inspite of being decorated with all these charges, the S4 helix can, quite unfathomably, happily sit inside the membrane! If one goes into the detailed physics of the issue, probably the only way this could happen is if, upon incorporation, the S4 helix alters the shape of the membrane (say thins it out). Such thinning has been observed by Kenton Swartz’s group through the use of neutron diffraction and solid state NMR measurements. However, the extent of thinning reported (~5A by the full VSD of KvAP) is far too small to explain the large energy cost of housing so many positive charges in the membrane. May be the water in the crevices help pacify the otherwise belligerent Args…who knows??? Of course all of this is largely speculative and the only way out of this conundrum can be by calculating energies of interaction. Structures are useful, but they provide no proof of interaction (strength/attractive/repulsive); computational evaluation of interactions are fraught with uncertainties about the force-fields; functional measurements are limited by accuracy of data collection and to what extent are the details considered. A common trait of scientists in the ion channel community (and may be all of science) is that – each have their own favorite assumption which they most of often cling on to with all their might – but who is to say which assumption is valid and which one is not? For example, water in crevices seems to be “so big a deal” for the proponents of small scale VSD motion – the assumption is that water in the crevices has the same properties as in the bulk. On absolute scale, such an assumption can be only partially correct, at best (and at worst, completely wrong!!!) since several experimental physical chemists have strongly argued and demonstrated that water within crevices have vastly different properties (the list not limited just to dielectric constant) than bulk water. However, we chose not to deal with such an assumption largely because of absence of methods to show its significance/insignificance. The major thrust in the study of ion channels is mutation and analysis of mutations – now if one begins to consider that even a single point mutation could disrupt the structure, it might become impossible to publish even a single paper! Hence we chose to, most often, neglect that assumption and barge ahead with our scanning mutagenesis studies. I am deeply passionate and interested about the physics of charge transfer dynamics in the voltage-sensors. Unfortunately, the close-mindedness of our community, which is upheld under a facade of scientific skepticism, is just too overbearing at times :(. Thank you for the awesome comments! I really enjoyed reading them and have spent the last few days pondering them. This is exactly the kind of discussion that I was hoping to generate when I started the blog. Below I have tried to respond to each of your points. Please let me know what you think. Also I would love to hear from any anyone else. It is clear that other channels don’t have the exact same pattern of charge compensation. I imagine that altering the distributions of charges within the membrane would be an excellent way for evolution to alter the gating behavior of the channel. Moving or removing counter charges in the membrane would affect the relative stabilities of the different channel states. More work certainly needs to be done to fully understand this potential mechanism. Also these different channels don’t all have the same number of gating charges so until we have more structures it is difficult to compare them directly. Thank you for bringing up the very interesting work of Pless et al. I really should have included this paper in my discussion but somehow it slipped my mind. What they show is not that these residues have no role in stabilizing the different conformations of the VSD but that their role may not be mediated by direct electrostatic interaction with S4. Instead, their role may be more about, as you say, generating a charge stabilizing hydrophilic environment proximal to the gating charges by attracting water into the VSD structure. Perhaps the way my post is written it emphasizes electrostatics too much and doesn’t emphasize hydrophilicity and water penetration enough. Clearly both are important and related. Additionally, it is very clear from their data the most buried external charge-compensation site (the outer S2 acid) is clearly electrostatic, which completely supports the arguments present in this post. There are certainly potential caveats to the work of Hoshi and Armstrong and you very nicely point them out. To be devils advocate, the effects they see are from adding 50 μM La3+ – which of course comes along with 150 μM Cl- – to solutions which already contained over 140 mM Na+ and 150 mM Cl-. This is not really comparable to the 10-fold changes in ionic strength done by Islas and Sigworth. Therefore, I would imagine that the ionic strength effects of Debye-screening would be minimal. However, it is certainly possible that strong interactions of La3+ with the phosphate head groups of the lipids could be partially (or wholly) responsible for the changes in gating seen. In the 2005 Science paper from the von Heijne lab Hessa et al. “conclude that the S4 helix is poised near the threshold of efficient bilayer insertion” and even calculate a positive apparent free energy of translocon-mediated integration. To me this does not indicate that the S4 “readily inserts” or that it can “happily sit in the membrane.” Can it insert, yes, with low efficiency. The fact that, as you say, the membrane likely distorts to accommodate the inserted S4 indicates to me that it is pretty unhappy. Also the fact that Hessa et al. observe that a significant proportion of the S4 helices do not insert into the membrane is also telling. Finally they conclude that, “If one or two of the Arg residues in S4 are partially shielded from direct lipid contact in the intact channel structure, as has been proposed, ΔGapp might be further reduced.” As I demonstrate in this post, the structure shows us how this stabilization is achieved. You are completely correct in saying that structures do not provide interaction energies and that existing problems with force fields prevent accurate computational deduction of interaction energies. However, the structures do clearly show us which interactions exist and it is now up to us to figure out the experiments that need to be done to determine the specific energies to truly understand their relative importance. It is well known by anyone who studies these channels that a significant proportion of point mutations results in either no expression or non-functional channels, so clearly a single point mutation can disrupt the entire channel structure. This can also be true for soluble proteins. I am certainly not saying that people shouldn’t do or publish mutagenesis studies, only that we have to be careful when we interpret them. This can be difficult in modern publishing, which encourages and even insists that scientists over sell their findings giving the impression of close-mindedness and being married to assumptions. However, with very few exceptions, most scientists in the field that I have met don’t actually believe their own hype. This problem with scientific publishing is part of the reason I felt the need to start this blog. As per always, the best way to combat close-mindedness in science is to perform more carefully designed well thought out experiments. Anyone who loves science loves being proven wrong. The tricky part is in the proving. One small comment, mainly in response to the thread from the previous comment. We worry a lot about whether our mutations have global effects, or change things in ways we did not imagine. Whenever there is a way to test the overall integrity of the protein, we are happy to do it. If you mutate a voltage-gated channel and it still gates in response to voltage, this supports the general integrity of the protein – voltage-gating seems a fairly complex activity. In our in-press JGP paper, we point out that our MD simulations produce a similar water profile for the mutant as for WT channels, which also argues that the overall structure is reasonably intact. Once someone (hint, hint) determines the structure of Hv1, they will be able to determine structures for all the important mutants, too! Mark Paddock did this with the bacterial reaction center – whenever he made a mutant, he determined the crystal structure, just to be sure! Thanks for the comment. Of course I agree that if a VSD is still capable of gating in response to voltage it suggests that the structure can’t be completely disrupted. However, many mutations have large effects on both the kinetics and midpoint of the voltage-gating in ways that we are still unable to fully explain. I completely agree that we need more structural information on VSDs in order to better understand mechanism and how the gating is altered by the mutations. Every serious scientist worries about potential nonspecific or global effects of their mutations, however, because of the nature of scientific publishing sometimes these concerns are not fully addressed in the papers. That is why I wanted to start this blog so we could discuss these issues that don’t always make it into the literature. Looking forward to seeing your paper when it comes out. Please post a link to it here when it comes out. The points which I had raised and you further commented on were not to say that charge-pairing does not occur. Rather that, although such a concept was proposed in the mid 1980s (or may be even earlier), even after 25yrs our understanding of such a basic proposition remains fraught with equal amounts of uncertainties! E293 neutralization with Nha: no effect GV. But kinetics of GV and FV are slowed down. Through some funny/unexplained calculations, the authors concluded that the pronounced deceleration of the kinetics (which by some weird way corresponded to a 3-fold change in the activation/deactivation kinetics) suggests its role as a “modest catalyst”. The way the paper is written it is worded in such a way so as to suggest that E to Nha substitution does not apart from change the charge, but E to Q makes a H-bond donor, a H-bond acceptor, thereby suggesting that solvation at the site plays an important role. Dougherty’s group have clearly shown that the H-bonding capacity of Nha, relative to E, is ~2-3 kcal/mol weaker. If the effects observed on perturbation of the site are largely via solvation, then Nha would’ve had more of an effect (this is just speculation on my part). The next point in this regard is that, E293 when mutated to Q produces steady-state GV, QV and FV curves which aren’t signficantly different from WT. The effect of E to Q mutation is large seen in the limiting slope analysis (Seoh et. al. Neuron 1996), where it was seen that this negative charge neutralization reduces Qmax from 13 to ~9. So my point is a similar experiment needs to be done with E293 to Nha to actually say whatever Pless et. al. want to say about this site. Finally, about the role of this E293 in reducing Qmax – if you compare Aggarwal and Mackinnon’s values to Seoh et. al.’s values, there is a consistent discrepancy of 2-3 charge units for almost all the charge neutralizations. (The charge add back experiments by Ahern and Horn in JGP actually support Aggarwal and Mackinnon and are not in agreement with Seoh et al). Is the reduction of Qmax due to E293Q, real to begin with? Also it must be mentioned that the comparable site in the BK channels is a Tyr. Ma and Horrigan (JGP 2006) found that mutating this site to E does not have any effect on Qmax. So, where are we about really understanding the role of E293 in the functional cycle of the VSDs – for me, actually nowhere!!! Next for E283, Pless at. al.’s data and analysis is more palatable (but only slightly so). If you see the crystal structure of 2R9R, there are water molecules everywhere around the E283 site. How can charge pairing occur if there is water all around? About the D316 site, I wouldn’t know what to make of it, if you consider the data in the supplementary information. The other thing which I just want to mention that while stabilizing the charge is important. Keeping it a bit unstable is also as important, so that things can happen at the millisecond time scale. It is almost reminiscent of Dr. Mackinnon’s Nobel Lecture Video, where he talks about the paradox between flux of ions and the high selectivity of K ions. While the charges need some stabilization, I firmly believe that it is necessary to have forces attenuating such stabilizations as well, so that the energy barriers for the transitions are relatively smaller such that the charges can move up and down quickly as the voltage-changes.